Charles Vickers, an engraver at the U.S. Mint in Philadelphia, holds the plaster cast image of John Adams used to make the new dollar coin, part of the Mint’s Presidential Coin series. PHILADELPHIA — Would John Adams ever have imagined he’d be remembered this way – his face on a $1 coin, cascading from collection chutes like Las Vegas slot machine tokens? In a cavernous production plant in Philadelphia’s Old City section, the U.S. Mint is busily turning out millions of the Adams dollars, as the agency gets ready to spotlight the nation’s second chief executive and Braintree native in its new Presidential Coins program. The Mint launched the series in February with a George Washington coin. 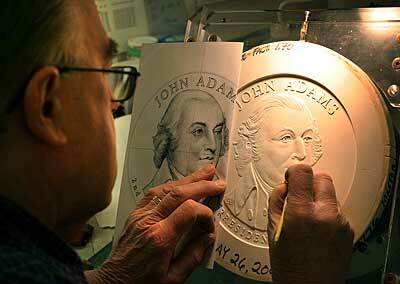 The Adams coin will be released on May 18, to be followed by Thomas Jefferson and James Madison this summer and fall. This is the first time Adams has been honored with a regularly circulating coin or paper currency. He appeared on a 2-cent postage stamp in the late 1930s and the ’40s. For that reason, officials at the Adams National Historical Park are looking forward to the coin’s appearance – and Adams’ new role as pocket change. Like the Lincoln penny and the Jefferson nickel, “This will bring John Adams into people’s lives in a new way,” said the park’s assistant superintendent, Caroline Keinath. The presidential coin program is scheduled to run at least through 2016, when coins for Richard Nixon and Gerald Ford will be issued. No living current or former presidents will be included in the series. Four new coins will be struck each year, in successive order of terms. That means John Adams’ son John Quincy Adams will get his turn in 2008, as the sixth president. His will be the third Adams coin to be issued by the Mint. A 24-carat, $10 gold “presidential spouse” collector’s coin for John Adams’ wife, Abigail Adams, will be released in May, around the same time as the John Adams $1 coin goes into circulation. All the presidential coins are composed of a golden-hued magnesium-brass alloy over a copper core, as is the Sacagawea dollar. Half the total are minted in Philadelphia, the other half in Denver. While the presidential dollars are in ways a separate stream of the currency, since they won’t be struck year after year, they’re taking the same path from design to use that all circulating coins follow. Proposed by U.S. Rep. Mike Castle, R-Del. – who coined the idea for the Mint’s popular State Quarters – the presidential series was authorized by Congress in 2005. Design and planning for the Adams dollar began in February 2006, the same time as work on the Washington, Jefferson and Madison coins. By the time the Adams coin was ready for production, the project had passed from the Mint to specially commissioned New York artist Joel Iskowitz, an advisory committee, a federal arts commission and then back to the Mint and a staff sculptor-engraver there. In a phone interview from his home in Woodstock, N.Y., Iskowitz said he modeled his pencil drawing on a famous John Trumbull painting of Adams that hangs in the National Portrait Gallery – partly because the 1793 painting is the closest to Adams’ 1797-1801 presidential term, but also because it seemed to best capture the person described by his contemporaries. Once the Mint and the secretary of the treasury signed off on Iskowitz’s Adams design, it was assigned to engraver Charles Vickers, a Texas native who had a long career at the Franklin Mint before he moved over to the U.S. Mint. Vickers’ sculptured clay disk was replicated through a series of negative and positive molds – the last a hard, epoxy cast that was mounted on a 19th-century transfer-engraving machine, which miniaturized the 9-inch cast onto a coin-size, steel master die. That die was in turn used to fashion a set of dies for the coin’s mass production. Down on the Mint’s airline hangar of a factory floor – the world’s largest mint – the Adams dollar is piling up by the thousands every day, along with fresh batches of pennies, nickels and FDR dimes. The high-decibel, highly automated system first transforms coiled sheets of metal into blank disks. The blanks are then tooled to raise the edges and treated to soften and burnish the metal before they’re stamped with Adams’ image. As a final touch, the coins are fed into a precision unit that laser-cuts the motto “In God We Trust” onto their thin edges. Finally ready for spending and vending, the dollars are moved from collection bins to fabric containers that resemble giant tote bags. With a ton and a half of coins in each, the bags will be shipped to regional federal reserve banks in the coming weeks, and then out to commercial banks in the Boston area and elsewhere. Mint spokesman Tim Grant said coin users and collectors who have special interest in the John Adams dollar will get a break when it’s issued: For the first six weeks, the coin will be available at banks in unmixed $25 rolls and boxes of 1,000.